Great for phones, MP3 players, Sky Caddies, GPS units and more. Eurostyle USB and 12 volt charger metal body assembly. Easy to install and RoHS compliant. 5” wide x 3.75” high x 2.62” deep. Exactly what I needed and was looking for! No more swapping out adapters and rotating chargers! 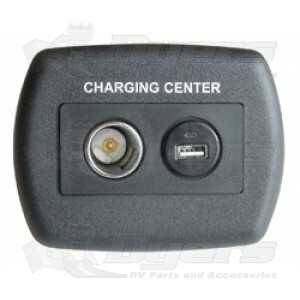 Now everyone gets a "charge" from oneof the 2 USB jacks or a standard 12 volt car plug. Nice upgrade to my trailer. Recently installed RV now and storage will put product to use next season.